Here, in this sentence, we have a saying of Jesus as reported in St. Matthew’s Gospel which, once again, can only make us reflect on what truly ‘Good News’, the teaching of Jesus is. There is so much evidence, in both the Old and the New Testaments, that points us to this conclusion, but, most often, we do not heed the message, or understand its importance. This little statement must lead us to thank God that we are all sinners, assuming that we want Jesus to call us to him. In 1 John 1: 8 we have a further quotation that corroborates this: “If we say we have no sin, we deceive ourselves, and the truth is not in us”. 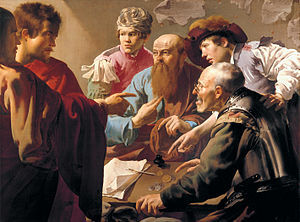 According to the Gospel, Matthew was a tax collector, hated, therefore, by the Jewish people because of the tax collectors’ continual exploitation of the people. Pharisees, who loved their Jewish law, and the observance of it, especially hated them, and above all those Jewish tax collectors working on behalf of the Romans, who governed their country. Matthew could have fitted well into both these categories. Jesus called Matthew, and he got up and followed. He was one of ‘The Twelve’ and lived in the company of Jesus, for the two or three years they were together. Those apostles had many adventures. 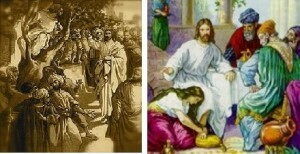 They were with Jesus when he worked his miracles; with him when he preached the Kingdom, when he encountered his Mother and family – a Mother and family who seemed to think that Jesus was ‘out of his mind’ for leaving them, the people of Nazareth, and going off to live his wandering life. The Apostles were sent out to preach, heal and drive out devils, which they did. It is probable that Matthew was with the ‘others’ when the two brothers, James and John, prompted by their mother, asked to be first in the Kingdom, and this provoked a jealous reaction from the rest. He would have discussed with the ‘others’ which was the greatest among them, and Jesus, knowing what they were doing, took a child and told them that, ‘… unless they became like little children, they would never enter the Kingdom of heaven’. He was with the ‘others’ at the Last Supper, when Jesus washed their feet; he saw Judas betraying Jesus in the Garden of Gethsemane, and he, too, fled the scene and deserted Jesus at the time of His greatest need. On the first Easter Sunday, he experienced the amazing triumph of Jesus, Risen from the dead, and all the episodes recorded in the Gospels in that following period, when He was living on earth in his Risen body. Then he witnessed the Ascension, the descent of the Holy Spirit, at Pentecost, and afterwards, like the ‘other twelve’, he is said to have evangelised in various places. These events, and reflecting on them in the community of faith, in which he lived, after Jesus had gone to heaven, formed Matthew’s mind. It may have been in later life that he was able to appreciate, as a personal experience, the saying of Jesus that begins this blog: “Jesus did not come to call the virtuous but sinners”. “Should we sin because we are not under the law but under grace? By no means! Do you not know that if you present yourselves to anyone as obedient slaves, you are slaves of the one whom you obey, either of sin, which leads to death, or of obedience, which leads to righteousness? But thanks be to God that you, having once been slaves of sin, have become obedient from the heart to the form of teaching to which you were entrusted, and that you, having been set free from sin, have become slaves of righteousness”. I once ‘buried’ a man who was really worried that he would go to hell; somehow, in this, I think that Fr. Ambrose once again comes to our rescue. Ambrose had the simple faith of a child, right up to the moment of his death, in June of this year – an unshakable faith that God would look after him, and help him. Thanks be to God, for the ‘Good News’ of Jesus: “I did not come to call the virtuous, but sinners”, and although God will purify us to be whiter than snow, it is a fact that, all human beings who are saved, are ‘redeemed sinners’ – all, that is, apart from Jesus and his Blessed Mother. In e-mailing the blog, ‘Word Press’ tends to distort the original formatting of the document. Readers may prefer to visit the website www.stmarysblog.co.uk to read it in its original format.